Jason Peters, injured on the sidelines, uses hand signals to communicate with his sub, Halapoulivaati Vaitai, in the third quarter. TAMPA, Fla. – The NFL's highest-paid unofficial assistant offensive line coach gave his teammates plenty of good advice Sunday, but the Eagles desperately needed him to do what they are using $10,666,666 of their salary-cap room for – anchor their offensive line. The first half of Sunday's 27-21 loss to the Tampa Bay Buccaneers was a confused, hectic mess for just about every Eagles position grouping. 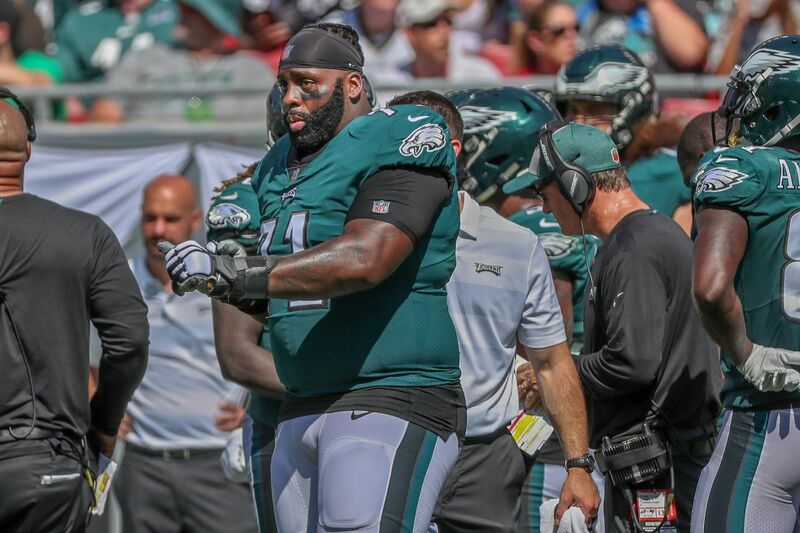 Among the factors that made it that way was the loss of Jason Peters, the team's future Hall of Fame left tackle, to a quad injury in the first quarter. He spent the rest of the game on the sideline, advising his linemates, and especially backup Halapoulivaati Vaitai, who eventually found his rhythm after some rough moments. This just might be what life is going to be like for a team with the league's oldest left tackle. Peters is going to turn 37 in January and while he is still able to play really, really well, and no one doubts his heart or courage, his body has 15 years of NFL mileage on it. Last season's magical playoff run notwithstanding, this is not as good an offensive line when Peters isn't on it. Particularly when his sub hasn't had the practice reps, and gets tossed out there in the middle of a full-team meltdown on the road, against a good defensive line. "I did it in practice, the last play of 'team' [full-team reps] on Thursday. I was trying to get it ready for today, and got it OK to start and see what I could do," said Peters, who never appeared on the Eagles' injury report. "I want to say, on about the third play of the game, I strained it again. It kept grabbin' on me. I was like, 'Let me be smart about it,' and I just came out." Peters said he expects to play next Sunday at home against the Colts, in what is shaping up as the return of Carson Wentz. Wideout Mike Wallace probably won't play next week; he was wearing a boot in the locker room after suffering a right ankle injury early in Sunday's game. Running back Jay Ajayi also left the game early, with a back problem, though Ajayi eventually returned. "Any time you're down a couple of bodies, it affects you offensively, and it tweaks your plan a little bit," said Eagles coach Doug Pederson, who added that nonetheless, the offense's problems were largely "self-inflicted." Yardage and points the Eagles put up in the final 20 minutes or so, after Tampa Bay built a 27-7 lead, made the final score and stats more respectable than the game really was. The Eagles' offensive and defensive lines are supposed to be dominant. They were not on Sunday. The Eagles' second possession of the game was a travesty. Down 7-0 thanks to the first-play lightning of the Bucs' 75-yard TD pass to DeSean Jackson, Nick Foles hit Nelson Agholor for 17 yards, then Corey Clement for 14, then Clement ran for 11 – oh, wait, Agholor was flagged for a crackback block. It's first-and-20. Foles got 8 back on Mike Wallace's first catch as an Eagle. No, check that. Illegal block in the back by Peters, first-and-30. Two plays later, 12 yards to Agholor, no, there's a flag for tripping on Clement, second-and-40. One-yard loss on a Clement run, and it's third-and-41. Seriously? Teams that are focused and prepared don't face third-and-41 early in the game. Or ever, really. "Obviously not the start we wanted," right guard Brandon Brooks said. "It was very frustrating. I looked up once and saw it was second-and-40 or something," Peters said. "We shot ourselves in the foot. … Run the play, execute the play, and not lose yards on plays, and [not] get penalties. I know I had one right before I came out. Just gotta stop doin' that." "Penalties hurt us, especially on the one drive," left guard Stefen Wisniewski said. "A lot of little mistakes added up. We gotta try to get some bigger plays going. We gotta do a little better on first and second down – too many third-and-longs." Wisniewski said losing Peters was no excuse for the offense needing nearly three quarters to get any flow going. "It always hurts losing a really good player like J.P., but 'V' did a pretty good job," Wisniewski said of Vaitai. "I know he got beat once [on a Jason Pierre-Paul sack] but I think he bounced back from that pretty well. V's a good player. We can win with Big V."
Peters said that after the sack he told Vaitai "get in [Pierre-Paul]'s face, he's not a speed guy, he's more of a 'wiggle' guy. … Once he started doing that, he started getting comfortable, and the guy didn't beat him anymore." This was Vaitai's first real action of the regular season after a horrific preseason that called his confidence and poise into question. He did an excellent job on Clement's 15-yard touchdown run in the second quarter. "You just gotta be ready at all times," Vaitai said. "I just kept kickin' [on the sack]. I allowed Jason Pierre-Paul to go inside me, underneath me. It was just a bad start. … The next drive, I got a little feel of the game." Right tackle Lane Johnson noted that the Eagles "kept fighting to the end."